After all these years, Goldy is still a master at drawing attention to sporting events, pumping up spirit at 'Sota Socials around the country and promoting the university. Between version 1.0 and 2.0, the cold-air inflatable has undergone a bit of cosmetic surgery. And, since his left arm was most certainly tired by now, we alternated and raised his right arm in school spirit. You can see the original version here. 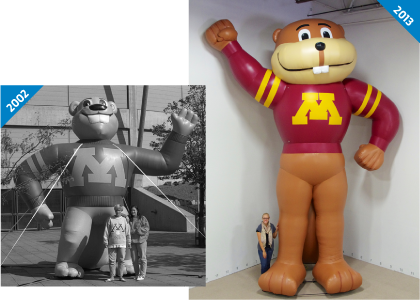 It’s fun to compare this and the most recent mascot you see below. Goooo Gophers! Looking to draw more attention to your sporting events? Browse our online galleries!